Every time that a friend or relative announces that she’s pregnant, I eagerly break out the needles and pastel yarns. 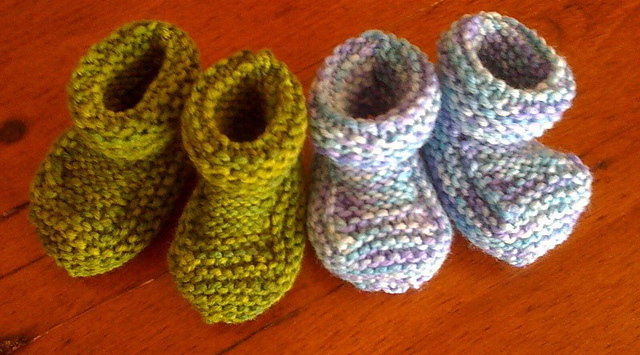 BK (before kid), I used to knit baby booties every time. They’re quick, adorable and easy. And aren’t those what you’re supposed to knit when you’re expecting? I experimented with a number of patterns before settling on Bernat’s creatively named Baby’s Booties (available for free on their website) and Simple Bootees from Claire Montgomerie’s Easy Baby Knits. Both make lovely booties, and both are wonderfully easy for novice knitters. The Bernat pattern is knit flat in worsted, while the Simple Bootees are knit in the round with sport. They were also great stash busters. 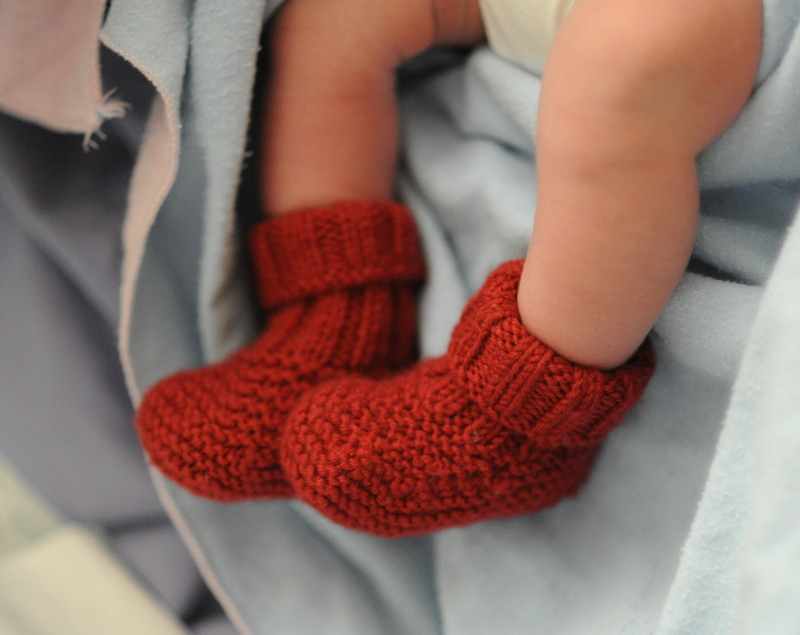 When our little guy arrived, we, of course, put his perfect little paws in both sets of booties. Immediately something became very clear: the Simple Bootees I’d been presenting at showers for years did not stay on. Furthermore, the sizes above newborn were ridiculous when compared to an actual baby foot. 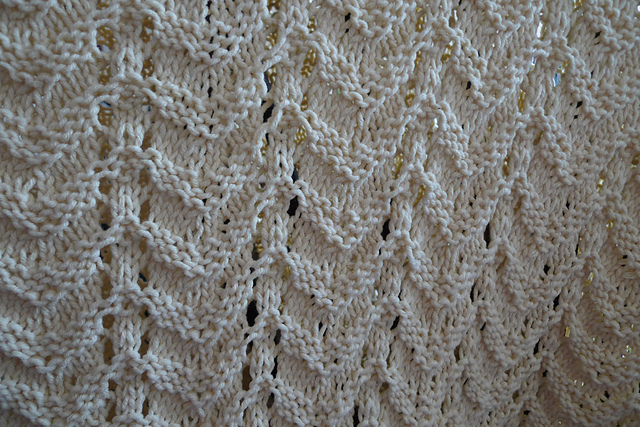 The Bernat pattern was much, much better that way. The booties stayed put, and had an appealing warm thickness that made you feel like a good mom for putting them on your little one. However, I’ve stopped making baby booties. After going through the first year with our little guy, and after watching my sister and sisters-in-law clothe their little ones, I realized that booties are essentially useless to most parents. The first three months are a wild period of adjustment, and I’ve yet to see the parent who has a lot of time to think about accessories when they’re being woken up every 3 hours, all night. Furthermore, little babies often require full outfit changes every few hours, when leaky diapers and spit up strike. Most newborns spend their days and nights in one piece jammies with feet that save their parents from endless rounds of dressing and redressing, from piles of teeny tiny laundry and from thinking about baby’s clothing in any coherent way. Our baby booties were photographed lovingly and pulled on our little guy’s feet a few times during the 6 or 8 weeks they actually fit. Now they live in the home I expect is reserved for many lovingly crafted baby booties: the memento drawer. These days, I try to make practical shower items that will get worn out instead of making tiny adorable mementos. In our house, the unchallenged champion in the useful category is the Project Linus blanket from Betty Christiansen’s Knitting for Peace. The holes eased my anxious mind in the early days, and I’ve made this workhorse six times for various friends and relatives. My sister-in-law recently asked for a second Project Linus for her second daughter. To be honest, I’m a little sick of this pattern (my size 9 wood circular needles are literally dull), but it’s hard to resist knitting something you know will be used and cherished. I’m looking for a new pattern to take it’s place and would welcome any suggestions. I usually make it in Cotton Ease. The cotton blend is soft, washable and relatively inexpensive. Our blankie is a little worse for the wear, but more than two years later, my son is cuddling up under it every night; which for me is the real test of any knitted gift. This entry was posted in Baby knits and tagged baby, blanket, booties, Cotton Ease, shower gift on October 28, 2012 by lisagono.